Item #DB-2745: 21" long Arizona Turquoise Nugget Necklace with 11x15mm - 14x24mm Polished Nuggets; 90.10 grams TW; Sterling Silver lobster claw clasp. 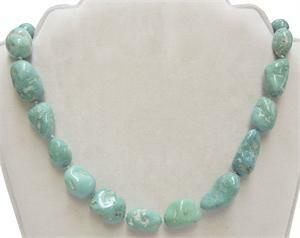 Item #DB-2738: 24" long Arizona Turquoise Nugget Necklace of 16.5x19mm - 19.5x23.5mm Polished Nuggets; 138.36 grams TW; Sterling Silver hook and slide clasp. Item #DB-2737: 25" long Arizona Turquoise Nugget Necklace with 13x13.5mm - 15x19mm Polished Nuggets and Sterling Silver hook and slide clasp.